Comfortably fits waists up to 41"
Convenient accessibility to the treatment balms you use in your practice. No more fumbling with loose bottles as you apply balms. 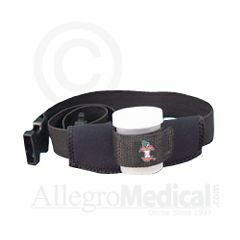 The holster comes with an elastic strap, which comfortably fits waists up to 41", or can easily slide onto your own belt. Four-ounce jar included.